With 7,000 + Nits brightness, the screen is clearly visible, even under direct sunlight. Tight pixel pitch starting with 6.67mm, 281 trillion colors and 3,840 Hz refresh rate, deliver bright,vibrant colors producing clear, vivid images and videos. Wide viewing angle of 160° horizontal and 120° vertical ensures your branding & advertising information reach the target audience at any distance. The LED modules of the Genesis II are engineered by a stringent R&D process in design architecture, and material selection using state of the art assembling machinery. All combined with an effective quality control process to deliver peak performance with the utmost in reliability. Silicone Gel sealed on both sides: Prevents oxidation of components and solder joints etc. 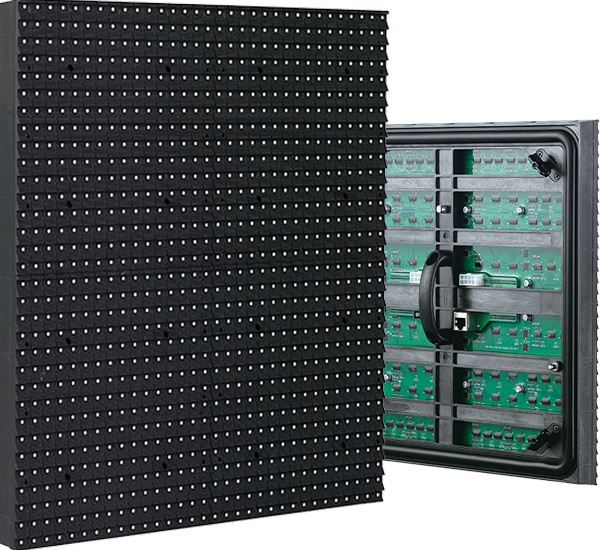 The Aluminum cabinet of the Genesis II is IP65 rated, ensuring the product is electrically functional and stable in all climates, including harsh weather conditions and extreme temperatures. The effective heat dissipation of the Genesis II design ensures long lasting, and dependable performance. Gold wire bonding LEDs; 1.6mm 4 copper layer PCBs; Optically - Optimized Mask with high quality GE plastics; Impeccable soldering & Silver contained solder; Power supplies efficiency ≥ 90%... and more! The internal components of the display can be accessed easily from the front, with a 1⁄4 turn of 4 spring loaded hex fasteners located at the corners of each module. It will take only 20 seconds to disassemble and remove one module. Dakco Genesis II led displays are UL48 certificated (The UL Standard for Safety for Electric Signs) and FCC compliant. Our Las Vegas office has a complete stock of fully assembled and tested inventory of the new Genesis product line-up, to ensure the fastest delivery time to meet your deadline. LEDs - How to Verify The Quality? LED Display's PCB - How to Verify The Quality? Yes, I want high quality led displays to grow my business.